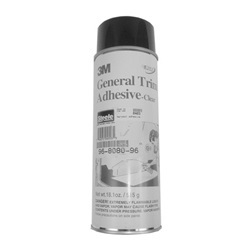 A rapid drying, high strength, light colored adhesive in an aerosol container. 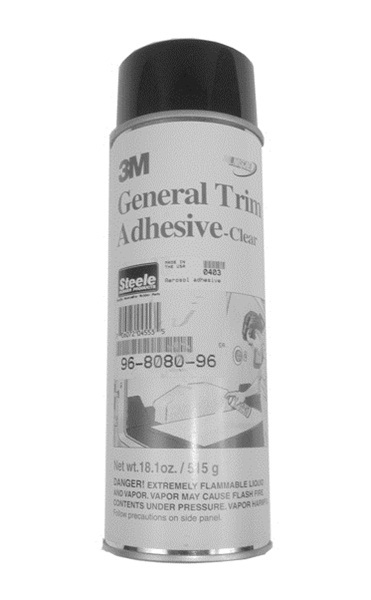 Designed for bonding most types of material used in automotive trim operations except unsupported vinyl. Excellent for fabrics, upholstery, foam, jute pads, carpets, re-bonding vinyl top sections, and similar automotive parts. Has adjustable spray pattern, high initial strength and does not require shaking or agitation before using. Provides good heat resistance. 16.25 oz aerosol.